Thanks to the extended opportunities to use electronic or digital methods to buy almost anything these days, online transactions are growing in number daily and reducing the need or want of consumers to leave their houses in order to make a purchase. While it has become easier to conduct daily consumer transactions, it has not become overwhelmingly safer. Concerns over computer hacks and the security of personal financial files make it worrisome for consumers, and that concern is multiplied when the transactions involve significant amounts of money, as they do when a wealthy investor conducts portfolio business online. The ease of transactions does not mitigate the cyber-danger of each and every transaction. Spectrem research shows that many investors believe a robo-advisor can perform most investment tasks just as well as a human advisor. The question is whether concern over the security of financial information when using a digital service causes investors to avoid using robo-advisors, or performing other tasks online. Spectrem’s new study Wealthy Investors and the Use of Digital Tools shows that less than half of all investors use social media for financial purposes, and of those that do not, the No. 1 reason for avoiding Facebook, Twitter and the like for financial functions is concern over the privacy of their key personal information (29 percent). It is possible that an investor pauses before hitting the send button on all sorts of financial transactions while they ponder the safety of their financial records and key numbers. Advisors who promote robo-advisor services as part of a package for clients should consult with investors to determine if they are holding back because of cyber-security concerns. Seventy-six percent of all investors with a net worth over $100,000 worry about the security of their financial information when they use social media platforms, even if they are not performing financial functions. That concern is probably elevated when they are submitting data related to their portfolio or banking and savings accounts. The concern is not just about having financial information stolen. 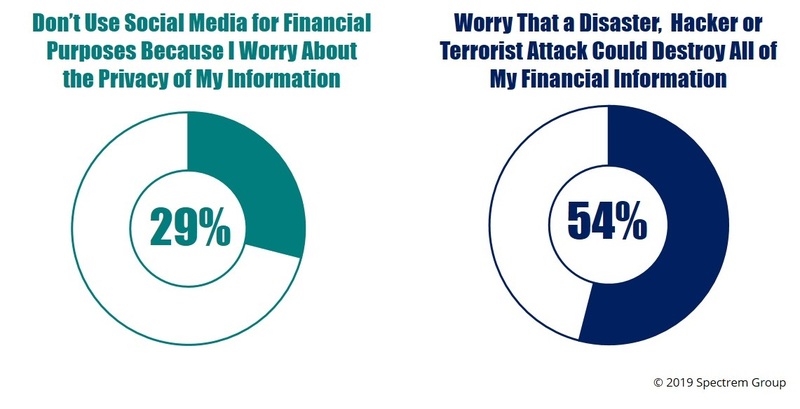 They also report concern that financial information can be destroyed. Which is why 60 percent of all investors save hard copies of all of their financial information and transactions. But that calls into question how much concern the other 40 percent have over the long-term safety of the financial information they have submitted online.